The D2 is quite an improvement over the D1 in terms of armament, and has similar mobility and armour. Unfortunately, as a Tier 3 medium tank, the D2 will occasionally be put into Tier 5 battles, where it is woefully outclassed in nearly every aspect. In a Tier 3 or even Tier 4 match, however, it is more than capable of holding its own in good hands. The D2 features the second heaviest armor of any Tier 3 tank (the heaviest being the other French Tier 3 tank, the AMX 38), and has a good pool of HP. In a Tier 3 match, a D2 that has properly angled its armor is a formidable opponent for most tanks. The top gun, the 47 mm SA37, is an excellent gun for a Tier 3 tank, easily capable of dispatching most other Tier 3 tanks. What really lets the D2 down is its underwhelming mobility. It is highly vulnerable to being swarmed by faster tanks and can be easily circled thanks to its slow turret and hull traverse speeds. In a Tier 4 match, the D2 can still be competitive, but has to be on the lookout for certain dangerous threats like the Hetzer, Matilda, and B1. Like the Pz.Kpfw. S35 739 (f), a tier 5 match is a far more dangerous environment for the D2. Many of the Tier 5 tanks are capable of easily piercing the 40 mm armor, and the D2 does not have either the mobility or the view range to act as a scout like the BT-7 or PzKpfw II Luchs. Nor does the 47 mm SA37 have enough penetration to engage Tier 5s head on. It is highly recommended to stay and guard the base and SPGs in your team, however, the D2 can make itself useful by acting as a support tank, engaging lower tier, lighter tanks that can be a nuisance to friendly Tier 5 tanks. 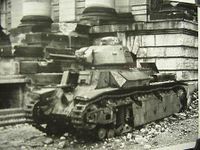 In 1930, at a time the Char D1 had not even entered production, the Renault company agreed to build a better armoured version called the Char D2. By using welded armour plate instead of the dated riveted design of the D1 this would be lighter than a simple version of the D1 made with thicker plating. The tank should be able to serve as an alternative in the rôle of battle tank for the heavy Char B1, should the latter be forbidden by treaty. The failure of the armament limitation talks resulted in a severe reduction of the projected manufacture, now in the form of an interim tank. Organisational difficulties with Renault caused the actual production of a first series of fifty to be delayed to the years 1936 and 1937. A second series of fifty was ordered in 1938, despite indications that the type was mechanically unreliable, as a possible cheaper addition to the expensive Char B1, to be able to raise more armoured divisions of the Infantry Arm. Due to Renault's financial problems, this second, partially improved version, was only realised in early 1940, bringing total production to a hundred. The three prototypes were, among others, fitted with turrets of the Renault FT 17 during a mock-up. The production models of the first series had the APX-1 turret, armed with a short 47mm SA34 tank gun. The second series used the much more powerful 47mm SA35 tank gun; from March 1940 this was retrofitted to a number of the older vehicles, despite a parallel project to rebuild them as flamethrower tanks. In 1937 the type equipped one tank battalion, which was considered an elite unit, as part of Charles de Gaulle's regiment. It was well-trained in the use of advanced tactics, including the use of radio-sets. In 1940 the effectiveness of this unit had much diminished, because of the worn-out state of its tanks, aggravated by the decision to raise three autonomous tank companies with the new vehicles, even though insufficient trained crews were available. Nevertheless the Char D2 units fought tenaciously during the Battle of France, losing most of their tanks to mechanical breakdown instead of enemy action. At the same time the Char D1 was ordered, a plan was made to develop a more modern tank. The Char D1 had already departed from the pure infantry support concept and evolved from a light into a medium tank, capable of fighting enemy armour; this made it the obvious candidate to be quickly changed into a lighter alternative for the Char B1 battle tank, needed because the latter type was in danger of being forbidden by an expected armaments limitation treaty under the auspices of the League of Nations, imposing an upper weight limit of twenty metric tonnes for armoured fighting vehicles. The Direction de l'Infanterie proposed on 23 January 1930, in a letter to the ministry of defence, to build a better armoured tank, using 40 mm plate, that nevertheless would be swifter at 22 km/h by fitting a 120 hp engine. The weight however should rise only from 14 to 15.5 metric tonnes, made possible by using welded instead of riveted armour plate. On 14 April the plan was approved and in May Louis Renault was contacted, who agreed to develop this type as the Char D2, together with a colonial tank, the Char D3, which would closely resemble its sister project. To introduce the new welding technique entailed hiring foreign experts, which was very expensive. Renault insisted that the costs would be paid in advance by the French Army, which off course had no corresponding budget available. On 8 December 1931 the deadlock was broken by a new agreement: Renault would first build a prototype with a riveted hull, the Renault UZ, which was delivered in April 1932. First the type was tested in Rueil; in May 1933 field tests were carried out by 503e RCC. The type was accepted for production, which decision was affirmed by the Conseil Consultatif de l'Armement on 12 December 1933. At that moment however, Germany had just left the League of Nations altogether, making the limitation talks irrelevant, from which then France retired also. Existing plans to produce 750 Char D2s, 150 per year for the period 1935-1939, (six hundred to equip twelve battalions and 150 as a matériel reserve) were immediately reduced. On 14 January 1934 the High Command confirmed only the plan of a first production order of fifty. All these decisions were taken on the basis of experience gained with the riveted prototype, though it was well understood that from it no firm conclusions could be drawn on the quality of the intended welded type. Meanwhile two welded prototypes had been ordered in December 1932. These were finished in August 1933, but only delivered in November. From December 1934 till the summer of 1935 the Commission de Vincennes used the three available prototypes to test different engine configurations. The riveted hull was equipped with a 120 hp petrol engine; the other two with diesel engines. These were rejected in favour of the petrol engine even though its combination with the intended welded hull had not yet been tested. Nevertheless on 29 December 1934 the order of fifty hulls was granted to Renault, at a price of 410,000 French Francs per piece. The turrets were produced separately. First the ST3 turret (Schneider Tourelle 3) had been tested in 1933; then it was considered to use the ST2, then seen as a possible standard turret for all heavier tanks, but finally a choice was made for the APX1, originally developed for the Char B1, costing ₣ 200,000 which brought the unit price to ₣ 610,000. The fifty vehicles were only delivered from May 1936. Due to this delay a planned second order of a hundred, to bring total production to 150, to be made in 1935, was cancelled. It had been assumed that the lighter Char D2 could be quickly produced as an interim type, to speed the formation of the first Infantry armoured division of the Infantry. In essence the Char D2 is an improved Char D1. The different turret type used, increases its height somewhat to 2666 millimetres; the hull is 175.5 centimetres high. The length of the hull, without tail, is 546 centimetres; its width is reduced to 2223 millimetres through the use of a narrower track, 35 centimetres wide. The suspension is largely identical but the top rollers, to which a tension wheel is added, are placed somewhat higher to prevent track resonance, a persistent problem with the Char D1. The armour plate covering the three vertical coil springs consists of six instead of eight panels; mud-chutes are added below each top roller. There are three bogies per side, each with four road wheels, a coil spring and two shock absorbers. In front, and at the back below the sprocket, there is a tension wheel with its own damper; identical to the road wheels proper they bring the total number of such wheels to fourteen. Another change are the fenders with large stowage bins that give the false impression to be part of the main armour. The production vehicles use far less welded sections than at first intended. To reduce the price, Renault has opted to implement a novel construction technique, using large flat screws, serving both as bolts and, applied heated, as rivets, attaching the main armour plates to each other by means of thin connecting steel strips. This way no internal girders, forming a real chassis, are needed. The armour plates are 40 mm thick. Like with the Char D1 there is a crew of three, but the radio-telegraphy operator is sitting to the right of the driver instead of the commander, and the antenna, of the ER52 set, has been moved to a position next to him. To make room a hull machine-gun is absent. This new configuration had been demanded to create a roomier fighting compartment. Two command vehicles, series numbers 2016 and 2049, have a second antenna on the left to serve their ER51 long range set. The engine power has increased considerably to 150 hp by installing a Renault V-6 9.5 litres motor, but as the weight has increased to 19.75 (just below the twenty tonne limit) instead of the intended 15.5 metric tonnes, the gain in maximum speed is limited to 23 km/h. The gear box has four speeds. Four fuel tanks together holding 352 litres allow for a range of a hundred kilometres. The wading capacity is 120 centimetres, a trench of 210 centimetres can be crossed, an obstacle eighty centimetres high or a slope of 50% climbed. The hull has a fixed 7.5 mm machine-gun low in the glacis on the right side. The commander is the sole occupant of the APX1 turret, acting also as gunner and loader for the 47 mm SA34 gun, which has a limited anti-tank capacity, and the optionally coaxial 7.5 mm Châtellerault machine-gun. The gun could fire two types of ammunition: a HE (High Explosive) called the Obus D with a shell weight of 1250 gramme and a muzzle velocity of 490 m/s; and an APHE (Armoured Piercing High Explosive), the Obus B Modèle 1932, with a shell weight of 1410 gramme, an explosive charge of 142 gramme and a muzzle velocity of 480 m/s. It rendered an armour penetration of just about 25 millimetres at a distance of a hundred metres, barely enough to be effective against light armoured vehicles. The first fifty vehicles, series numbers 2004 - 2053 (the three prototypes used numbers 2001 - 2003), having been delivered between 9 May 1936 and 23 February 1937, the ministry of defence decided on 10 April 1937, confirmed by the Conseil Consultatif de l'Armement in May 1937, to place a second order of fifty vehicles. This was done in the context of an on-going discussion whether or not to proceed with the production of the expensive and obsolescent Char B1; continued production of the Char D2 kept all options open. Renault gave the assurance that his factory could manufacture two hundred units per year. During 1937 the first reports regarding the operational use of the type were rather alarming in that they clearly indicated an unreliable vehicle. Despite hesitations the order was actually made in June 1938. However, production at first failed to materialise due to severe financial and social problems with Renault. This aggravated the reliability problems for the existing vehicles as also insufficient spare parts were manufactured. At the same time the production process of another Renault tank type, the AMC 35, was faltering. Interest in the AMC 35 project was more or less kept alive by a foreign buyer, i.c. Belgium, and something similar happened for the Char D2. In August 1938 a commission arrived from Poland, investigating whether the Char D2 could be produced for that country, using an export credit of a billion franc that Poland had obtained in September 1936 to procure French weaponry. Initially Poland had favoured the more modern SOMUA S35 but sales of that type had been denied, priority being given to the needs of the French army. Negotiations, complicated by issues of technology transfer and a possible licence production, failed at first; however, early 1939 it was considered to direct the second production batch to Poland, but this was eventually forbidden by the French supreme commander Maurice Gamelin. He had learned that the condition of the first fifty vehicles was so poor that the best way to keep the single battalion equipped with the type operational was a complete replacement of the older with the newer vehicles. The first batch could then be used to be rebuilt into flamethrowers. After the start of the Second World War Édouard Daladier on 27 September 1939 decided that the type would not be among the few chosen for further mass production but that the second order would nevertheless have to be completed to indeed allow a replacement; a first batch of fifteen flamethrowers was ordered. This also implied that funds were made available to recommence manufacture at Renault. Plans foresaw a delivery of five vehicles in February 1940, eight in March and then ten units each month until the last seven would be delivered in July. In fact in February six vehicles were produced, in March seventeen; six in April; thirteen in May and eight in June. Actual deliveries to the Army again differed: five (series numbers 2054-2058) on 27 March; eight (N° 2059-2062 and 2065–2068) on 22 April; ten (N° 2069-2078) on 6 May; twelve (N° 2079-2090) on 25 May and finally two (N° 2063 en 2064) on 6 June. Of the remainder of thirteen vehicles (N° 2091-2103) it is unknown whether they were ever handed to the forces: they were sent south when the Renault factory had to be evacuated on 12 June. The second production series featured several improvements. The most important of these was the fitting of the APX 4 turret, equipped with the longer SA 35 gun, which had a far better antitank-capacity, with about twice the original armour penetration. Due to the longer rounds the ammunition load decreased to 108 rounds. The new turret also had PPLR X 160 episcopes instead of Chrétien diascopes and was fitted with a S 190 G attachment point on the roof above the back hatch, to use the reserve machine gun as an AA-weapon. 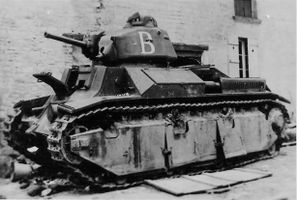 Analogous to the Char B1 bis designation for the similarly improved second Char B1 version, some internal unit documents in 1940 began to refer to the second series as the "Char D2 bis", but this was never an official name. Other changes included: an improved greasing system; reinforced ball bearings for the road wheels; a different form for the idler and sprocket to reduce the chance that tracks would be thrown; shorter mudguards; a thinner antenna; a new Vertex distributor and a Vlet starter engine using compressed air to reduce the demand on the battery. It was considered to rebuild the original production series as flamethrowers and a single prototype had already been modified in this way; on 27 September 1939 a first batch of fifteen had been ordered and on 23 April 1940 it was decided to modify all vehicles. Nevertheless there was a parallel plan, irreconcilable with the flame thrower project, to uparm them all. In September 1939 two of the five vehicles used at the central driver school (ECC) were experimentally fitted with the longer gun, leaving three tanks to be employed for training. 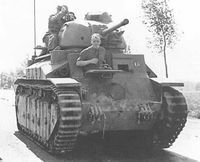 In the winter of 1940 it became apparent that France would have for the immediate future a lack of really powerfully armed tanks; at that moment the organic strength of SOMUA S35 or Char B1 units was just about three hundred. Adding 49 vehicles — the flamethrower prototype could not be easily turned into a standard tank again — would thus represent a not inconsiderable reinforcement of the battle tank fleet. It was accordingly decided to indeed modify the existing APX 1 turrets of the vehicles into the APX 1A version, a process that had already taken place to bring the original 34 Char B1 tanks up to Char B1 bis standard. The APX 1A retained the original protruding diascopes. From 9 March the turrets of the older vehicles were sent to the Atelier de Rueil in batches of fifteen, themselves divided in three smaller groups of five, to be rebuilt; at the same time it was planned to give the hulls a complete factory overhaul; due to a lack of spare parts this revision was delayed and less thorough than intended. Turrets and hulls would thus be separated, making it difficult to put the tanks together again in an emergency situation. The first five vehicles left on 11 March, taken from the 2nd Company of 19e BCC. Part of the first main batch were also a command tank and a replacement vehicle. On 12 April the second batch of fifteen was sent. Remarkably, this process did not lead to an official cancellation of the flamethrower project which — be it only on paper — continued to proceed. In April 1937 the elite 507e RCC (Régiment de Chars de Combat) based at Metz was the first unit to receive the Char D2. After sufficient crews had been trained three tank companies were raised, that the same year on 14 July participated in the Bastille Day parade, which was always used to publicly present new types. Some exemplars were adorned in the most complex factory camouflage scheme, using eight different hues outlined in black, among which such surprising colours as deep purple, lilac and sky blue. On 1 October 1937 the 1st Battalion of the regiment (1/507) was established as a Char D2 unit with an allotment of 45 tanks: each company had four sections of three tanks and two command vehicles; three were part of the central battalion reserve. The five remaining tanks were used in the central driver school. From 5 September Charles de Gaulle commanded the unit, in the rank of lieutenant-colonel until 25 December 1937, when he was promoted full colonel. De Gaulle, France's foremost armour specialist of the day, used the type to test his ideas about tank tactics, especially in the field of radio communication. Though a clear improvement over the Char D1, the new tank had its shortcomings. It was unreliable — engine, transmission, steering and cooling were too weak — and quickly wore out, demanding a large maintenance effort. This implied that the readiness was low of a type presenting in the summer of 1937 the majority of 47 mm gun tanks in France, the Char D1 having been phased out to be sent to the colonies, the Char B1 bis being built at a rate of three per month and the SOMUA S35 even yet having to enter mass production. On 26 June 1938 the tanks were during a special ceremony individually named after great French military victories, being baptised with bottles of champagne. De Gaulle would use the Austerlitz, Rocroi and finally the Yorktown as his personal tank during parades, having a cushion fixed on the turret hatch he had to sit on, to accentuate his already great physical height; his legs were so long he had to let them rest on the shoulders of the driver. When war threatened, France mobilised. According to the mobilisation plans the tank regiments would be split up and their battalions rearranged into autonomous tank brigades, the Groupements de Bataillons de Chars, that would serve as an armour reserve at army (group) level. Accordingly on 27 Augustus 1939 1/507 was renamed the 19e Bataillon de Chars de Combat under commandant (a rank equivalent to major) Ayme, and made part of the 507e Groupement de Bataillons de Chars, itself assigned to the armour reserve of Second Army Group. Mobilisation of both echelons (A and B) of the battalion was completed on 1 September and the next day de Gaulle resigned his command to become commander of the armour reserve of Fifth Army. After the outbreak of war — France became a belligerent on 3 September — a number of quick reorganisations took place: on 6 September the battalion was reassigned to GBC 510, on 8 September to GBC 511 and finally from 13 September participated in the Saar Offensive as part of GBC 517, the reserve of the Fifth Army. Moving on their tracks 120 kilometres to the frontline, thirty of the forty deployed tanks broke down: the vibrations caused by driving on a metalled road ruined the suspension systems. The unit was kept in reserve to repulse a possible counterattack by German armour, that never materialised. During the severe winter of 1940, the battalion remained in battle positions. It soon became clear that the type was ill-adapted to conditions of snow and ice. The track profiles were too flat and many vehicles were involved in serious accidents, slipping into a ravine. Due to their increased use, also in training exercises, the Char D2s were largely worn out at this moment. The battalion eagerly awaited the replacement of their, at that time 44, old vehicles by the second production series. The decision in March to upgrade the existing tanks came as a severe disappointment. It implied that the number of operational vehicles would at first decline even further as they gradually were removed from the battalion strength to be rebuilt. On 26 April the situation deteriorated even further when the order came to split off one of the companies. 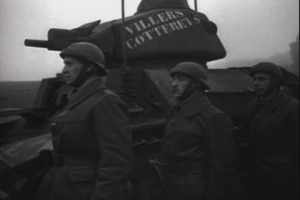 It would on 7 May be turned into an autonomous tank company, the 345e CACC (Compagnie Autonome de Chars de Combat) under command of Captain Jean-Charles Idée, to be part of the CEFS (Corps Expeditionnaire Français de Scandinavie), the French Expeditionary Corps of Scandinavia, that had been built up during the winter to assist Finland against the USSR in the Winter War. It was now, Finland already having been defeated, redirected to assist Norway against the German invasion during Operation Weserübung. By drawing lots it was decided that the First Company (1/19 BCC) would be sent. The company would be equipped with fourteen tanks of the second production series, leaving its old tanks behind. This seemed to imply that the new vehicles would never be destined for 19e BCC, not even in a later phase. On 29 April the company received its replacement tanks, but these transpired to be, though brandnew, in a very poor mechanical condition and broke down almost immediately. The causes were never investigated; conforming to the pervading Fifth Column atmosphere of the day, the malfunctioning was not attributed to the structurally deficient quality control at Renault combined with a hasty acceptance procedure, but to sabotage. Soon however, the plan to sent the company to Norway was cancelled as the reports of the previous winter clearly showed that the Char D2 was unsuited to snow conditions. Due to the events mentioned above, 19e BCC, a few years earlier still an elite armour unit, one of the most modern of France, had at the time of the German invasion of 10 May 1940 been reduced to a rather ineffective force. Its first company had been reassigned, even the latter's old vehicles were inoperational because the cannon-machinegun connector boxes of their sights had to be removed to be fitted in the new tanks — that had been delivered without any. Of the tanks of the other two companies 21 had been rebuilt with the longer gun, fifteen of 2nd Company and six of 3rd Company, but only five of these had been given a complete overhaul and could be considered truly battle-ready. The remaining nine tanks of 3rd Company were in the process of being rebuilt and without turret. Nor was there any direct prospect of receiving newer vehicles, as it had been decided to raise another two autonomous companies with these: 346e and 350e Compagnie Autonome de Chars de Combat with ten and twelve vehicles respectively. This decision proved to be ill-founded however: in the end the situation forced a reunion of all Char D2 units into one battalion. On 15 May the Germans achieved a decisive breakthrough near Sedan; the French command reacted to the crisis by ordering all available surplus tank reserves to be organised into ad hoc-units, in order to engage the advancing enemy forces. Both 19e BCC and 345e CACC were that day assigned to a newly to be raised armoured division, the 4e Division Cuirassée (4 DCR), that was to be commanded by Charles de Gaulle. However, neither of these units at first was able to operate in a coherent whole with other divisional subunits: 345e CACC between 17 and 20 May fought independently, attacking towards Montcornet on the flank of the German penetration, destroying several enemy columns swerving too much to the south; 19e BCC was in no condition to fight and kept away from the frontline, not participating in the counterattacks of 17 and 19 May by 4 DCR near Laon. On 17 May 346e CACC was raised with ten new tanks and crews taken from the 106e Bataillon de Chars, a training unit instructing in the use of the Char B1 bis. The men received a crash course how to operate the other tank type but it was soon perceived that they could not possibly acquire the necessary skills in the limited time available, so the company was in fact put to the disposal of 19e BCC, that kept the new crews in reserve and used their new tanks as replacements for broken down older vehicles. After already having been officially placed under its command on 18 May, on 21 May 345e CACC was actually reunited with 19e BCC as its 1st Company, to boost the number of operational tanks of the battalion; other measures taken to that effect included putting turrets on four vehicles of 3rd Company and fitting new sight connector boxes to some of the old vehicles of 1st Company; two of the latter's old tanks were cannibalised to provide spare parts. By these measures the battalion was able to commit itself to battle; it fought for the first time near Amiens on 24 May and was able to field a peak strength of 24 vehicles the next day. Soon however readiness again declined; on 27 May, the day of the large counterattack by 4 DCR to reduce the Somme bridgehead of Amiens, the battalion could only bring into the field seventeen tanks and failed miserably: the intended accompanying French infantry fled in panic when the tanks completed their approach march behind them, mistaking the rare type for German armour. When the Char D2s advanced to the German positions disregarding the lack of infantry support, seven vehicles were disabled by German antitank-guns. To bring the battalion up to strength again to function as a armour reserve during the expected main German operation against France as a whole, Fall Rot, on 2 June the 346e CACC was made an organic company of 19e BCC, but using thirteen older vehicles and (also poorly trained) reserve crews, assigned on 14 May to replace 1st Company, from the battalion. On 8 June 350ème CACC was formed with twelve new vehicles; it was adjoined to 19e BCC on 19 June. On that day this battalion was already in a dismal state, having had to cover the retreat of 4 DCR during the collapse of the French front. The large distances covered and the lack of time to carry out maintenance led to a quick reduction of the number of operational tanks. On 23 June, two days before the armistice, having again become separated from 350e CACC, the battalion was turned into a Bataillon de Chasseurs portés, a motorised infantry battalion, having lost all tanks. Of the 84 tanks known to be delivered to army units, 21 were destroyed or disabled by enemy action. Seven, all belonging to 350e CACC, were on 25 June still operational. Of the remainder 38 were abandoned after a breakdown, twelve were sent to a depot, three had never been in action being stocked in the 507e RCC depot at Vannes, of two the condition is unknown and one fell into a ravine. The Germans captured at least 21 Char D2s: nine that were turned in by the French and twelve that had been abandoned but not scuttled by their crews. They gave the type the administrative designation Panzerkampfwagen 733 (f) but, though some German units had temporarily taken Char D2s into service immediately after capture, apparently never officially assigned it to any unit. Some turrets were fitted to an armour train operating tn the Balkans. 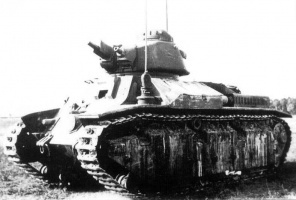 Of the tanks not surrendered the exact fate is unknown but at least one, possibly the exemplar fallen into a ravine, was later in the war used for clandestine research by Vichy armour engineers of the Service du Camouflage du Matériel (CDM). The D2's main armament consisted of only the 47 mm SA34 or SA35 gun. There is no indication that the 25 mm Canon Raccourci mle. 1934 or 47 mm SA37 gun was to have ever been fitted to the D2. Furthermore, the SA37 only existed as a field gun, and actually weighs a whopping 1,070kg, not 100kg. 1931 Char Renault D2 Web page at Chars-Francais.net. Photos, specs, and brief history in French. Renault Char D-2 On the D1 web page at the MilitaryFactory.com. Char D2 Web page at Wikipedia.com. This page was last modified on 16 December 2014, at 18:39.